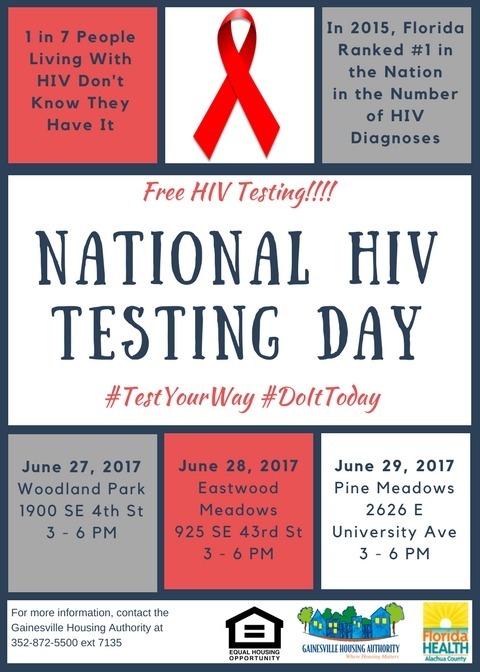 In honor of National HIV Testing Day, the Minority AIDS Program (MAP) is providing free HIV testing at several Gainesville Housing Authority properties. Through targeted outreach, testing, and linkage to care for people who are HIV positive, we can work to stop the spread of HIV in our communities. 1 in 7 people living with HIV don’t know they have it. In 2015, Florida ranked #1 in the nation in the number of HIV diagnoses. Let’s stop AIDS together. Tuesday, June 27, from 3 to 6 p.m.
Wednesday, June 28, from 3 to 6 p.m.
Thursday, June 29, from 3 to 6 p.m.